The design of chemical reactors and their safety are as critical to the success of a chemical process as the actual chemistry taking place within the reactor. This book provides a comprehensive overview of the practical aspects of multiphase reactor design and operation with an emphasis on safety and clean technology. It considers not only standard operation conditions, but also the problems of runaway reaction conditions and protection against ensuing over-pressure. Hydrodynamics of Multiphase Reactors addresses both practical and theoretical aspects of this topic. 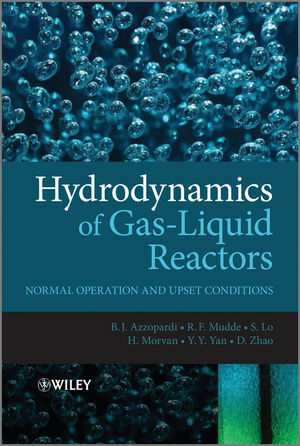 Initial chapters discuss various different types of gas/liquid reactors from a practical viewpoint, and later chapters focus on the modelling of multiphase systems and computational methods for reactor design and problem solving. The material is written by experts in their specific fields and will include chapters on the following topics: Multiphase flow, Bubble columns, Sparged stirred vessels, Macroscale modelling, Microscale modelling, Runaway conditions, Behaviour of vessel contents, Choked flow, Measurement techniques. Professor Barry Azzopardi is based in the School of Chemical and Environmental Engineering at the University of Nottingham. Barry is responsible for multiphase flow research , with particular focus on phase separation in reaction vessels, drop size measurement in complex systems, demisting, gas cleaning and flow in aero-engine bearing chambers. He has over 70 technical publications. Professor Robert Mudde is based in the Department of Multiscale Physics in the Faculty of Applied Science, Delft University of Technology, The Netherlands. His research interests include bubbly flows, advanced experiments in multiphase flows and multiphase hydrodynamics. He has authored more than 50 refereed journal papers and is an associate editor of the International Journal of Multiphase Flow.